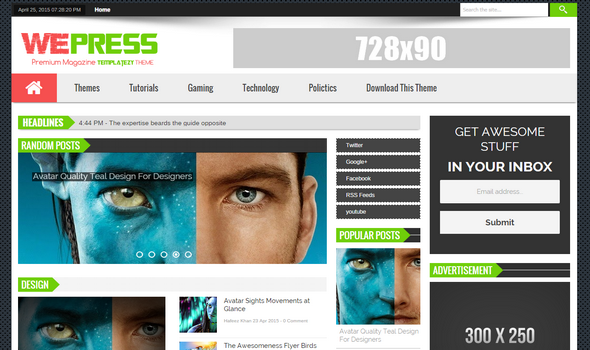 WePress Blogger Template is a dynamic & fully responsive blogger template. it is stylish and multipurpose magazine blogger template. 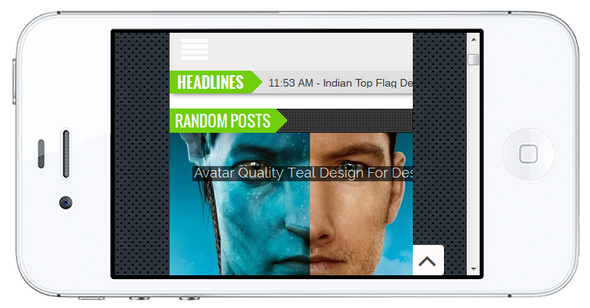 WePress Blogger Template is a dynamic & fully responsive blogger template. It has been developed officially using splendid & worthy scripts which would help to display posts, category, labels, slideshow and home sections dynamically. The first magazine blogger template seen on the web which cover almost every niche. This theme comes with lot of dynamic function like automatic slideshows, features posts, labels and indeed one of its splendid function is its category sections on home page. 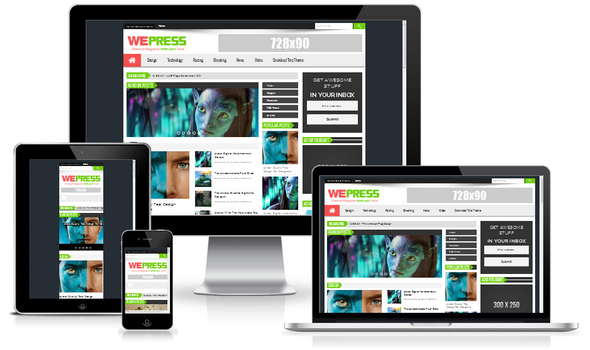 WePress can be used for multiple niche, like technology, design, news and much mores. All these features make it unique from other templates. A perfect multipurpose blogger template for writers, bloggers and designers. 100% Responsive Mobile Layout: WePress is also responsive just like Madeeha theme. This Template will display perfect on any screen resolution like, tablet, iphone, android and mobiles. An advance media queries are included for responsiveness. WePress Blogger Layout: We Press Template is an advance theme which is available in two different layouts. both interfaces are same excepts few changes are made. SEO Friendly Template: WePress is super SEO friendly and also uses an advance feature like Bread-crumbs similar to Magazine Theme. We have customized it correctly and applied the latest SEO techniques. One of the best feature you love in WePress is its dynamic function. All your content included slideshows, labels and features posts will be automatically displayed. So all things you found here are pure SEO friendly and 100% safe from bug. Sticky Navigation: Like our previous released, business Blogger Template, we integrated a cool splendid navigation with fixed position here in WePress. This navigation will remain appear to visitors when he/she is scrolling the site up or down. So this will help to stay visitor for a long duration on a site. Load Faster : WePress is a load faster template just like Fotolia. This will take a second to load on any browser completely. All you need to do is to add the label in home section dynamically. Ever fast template on blogspot. Drag & Drop Our Themes working based on drag and drop which means you do not need to customize the HTML structure of a template. Since, you can add a desire widget coding, or ads coding and past it from the layout sections with two steps only. This theme same working just like HippoMag. Ads Ready: Clients need Ads Ready template for their blogspot sites. Our overall collection included a ads ready slots for banners, adsense and advertisements. All our previous released and wepress have the functionality to display your ads correctly. The only thing you need to do is to add your ads coding. Related Post Thumbnail: A dynamic related widget has been added which would help to display the related posts with thumbnails style same as organic theme. The widget will display your post when a user assign a label to post else nothing will be displayed. We are really hopping you liked WePress blogger template for your next creative blog/site. We added all possible widgets and plugins related to Design and SEO respectively. Since, if we miss anything valuable then do not hesitate to mention in comment. Share you thoughts and what type of template you want ?.